In a small bowl, mix all the spices with salt and pepper. Pat the steaks dry and apply the spice rub on both sides. Let steaks sit for a few minutes or up to 2 hours (if more than a half an hour place in the refrigerator). Heat a skillet over high heat. Add the butter and as soon as it melts, add the steaks. Sear for about 4 minutes on one side, and between 2 to 3 minutes on the second side (for medium). Adjust timing to your liking. Let it rest for 3 to 4 minutes before serving. Hi Pati, I love watching all your shows! Thank you so much for sharing all your wonderful recipes! The directions say to marinate the skirt steak for up to 2 hours. Can I marinate the meat for longer (say overnight)? Sure! Just make sure to marinate it in the fridge then. Love this simple recipe. It has just the right amount of spice to create a tasty Mexican Skirt Steak. So glad you love the recipe, Cynthia. 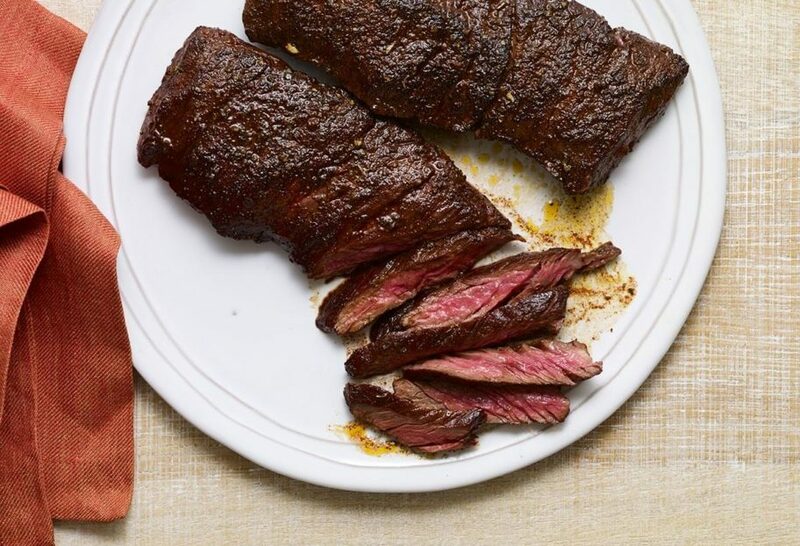 We really enjoy watching your show, Pati, and this recipe for skirt steak is outstanding! So simple but so flavorful. It’s a favorite at our house. Thank you! So happy that it’s another family favorite, Jackie! We have this at least twice a month!!! Fixing it now!! Love your show! Love your recipes! Love you. That’s awesome! Thank you for being such a great fan, Tony! Love your show! Can this rub be good with any type of meat, like NY strip? How long does it cook and at what temp? Hi Patti, I loved this episode with your son Alan cooking with you. I could tell it was a bittersweet moment at the end thinking of how much you’ll miss him moving away for college. I remember the same feeling with my daughter! I cried a lot for two weeks sfter we dropped her off! It got better. Love your recipes and so far tried the green beans-great!! Cooke this last night at our fire pit party in Bussleton Western Australia and it was fabulous, I love your show on SBS Pati and even if they’re repeats I get very upset if it’s not on – I just heard about the quake at Chiapas and Oaxaca – feel very:sad and hope people are holding up OK – very very dad. Did you hear that even in D.F. the golden angle was swaying!!!! Yes my thoughts and prayers are with everyone. Thank you so much Don! I’m so happy that it is now a staple in your kitchen…that is awesome! Delicious and so so easy mmmm. I watched this episode with my youngest son (11 years old) last night. I asked him if he wants to cook this meal with me and we would do it together; he said of course! He has shown an interest in cooking, so I am excited to do this with him! I love Mexican cuisine and you make it look so easy to prepare and you have such enthusiasm! Love your show!! That is fantastic! I hope you and your son have so much fun in the kitchen. Yay! So happy to hear that Craig. I just made this steak for dinner tonight, and it was absolutely delicious! Talk about quick and easy…my kind of recipe. Can’t wait to try many more of your recipes. Thanks! Super Cathy! Thank you so much! Just watched this episode. Your son Alan is so cute. What a great kid. You must be very proud of him. But I can’t believe you’re old enough to have a son going to college!! !